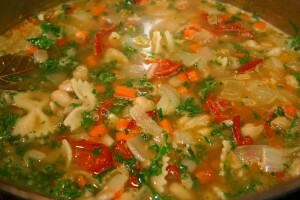 One of my favorite soup recipes for the winter is this easy Bean and Pasta Soup. I got the recipe from a friend many years ago and have modified it throughout the years. End results… Yum Yum Yum. Hope you enjoy it as much as we do. In a large pot heat olive oil on med-high and add carrots, celery, onion, red pepper flakes and garlic. Cook stirring until onions are almost translucent. 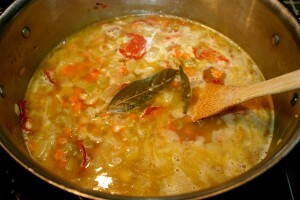 Add bay leaves, reduce heat to low and cover until carrots and celery are tender. About 5 to 10 minutes. 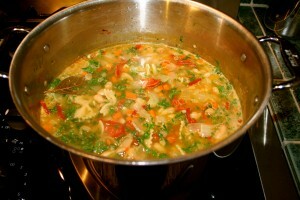 Add broth, & beans then bring to a boil. Next add sundried tomatoes or “Just Tomatoes” product and bowtie pasta. Cook until pasta is al dente. Approximately 10 minutes. Add chopped parsley to pot, stir and ladle into serving bowls. Garnish with Parmesan cheese to taste. Approximately 6 dinner size servings for the hungry. Enjoy! I like to use the Barilla Plus Farfalle pasta because it is a multi-grain pasta with protein and ALA omega-3 fatty acids. However, you can substitute any bowtie pasta for this soup. I think originally this recipe called for a 1/2 cup of olive oil. Way too much. So throughout the years we’ve been gradually reducing it and for us 4 tablespoons seems to be the right amount. We also really try to add organic ingredients to as many foods that we eat as we can. So if you can find it why not? Healthier, and less impact on the planet seems like a good idea to me. So far I’ve not been able to find organic cannellini beans anywhere so if you know of a source I’d love to learn about it. I like to use the curly variety of parsley and not the flat leaf. However, I’ve never tried the flat leaf with it so maybe it’s just as good? Maybe next time I’ll give that a try. Bay leaves are far less expensive if you buy them in the Mexican seasonings isle. Look for “Laurel Entero”. Our local Raleys supermarket carries mirepoix in the prepared veggie section of the produce isle. We’ve tried using that in a crunch one time but for some reason it didn’t taste quite as good as when you dice them fresh. Darn it. I hope you give this easy soup a try. It truly is one of the best soups I’ve ever had and it is just perfect for a cold winter evening dinner. If you do try it let me know what you think. SimpleMom is Having a Giveaway! Copyright 2019. Julia Janzen. All Rights Reserved.